So You Want to Remotely Manage a Computer From Another on Different Workgroups/Domains? Let’s say you have a Windows 7 computer, A, which is not in a domain, but simply in a workgroup at home. Let’s say you have a Windows server, B, which is a VM host but not in a domain. Let’s also say you have network connectivity between the two. You should be prompted for your administrative password on computer B. 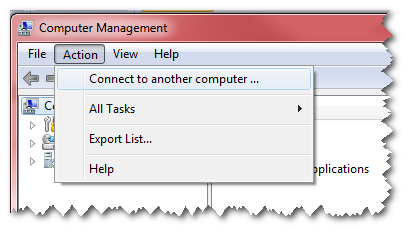 When computer management opens, select Action | Connect to another computer from the menu. You should be good to go…at least I was. This entry was posted on November 4, 2013 at 12:18 pm	and is filed under Computer Software, Networking. You can follow any responses to this entry through the RSS 2.0 feed. You can leave a response, or trackback from your own site.